✓ CLEANS WITH NO EFFORT: Jarder Spray And Leave Kills All Green Mould Moss & Algae With Ease, Without The Need For Scrubbing Or Pressure Washing! Simply Mix, Spray & Walk Away – Works Like Magic! 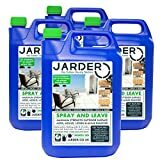 ✓ SUPER CONCENTRATE: One 5 Litre Bottle Of Jarder Spray & Leave Makes A Minimum Of 30 Litres Of Solution Covering A Huge 240m² Area – Jarder Spray & Leave Is a Maximum Strength Super Concentrate Boasting 50% More Active Ingredient Than Other Brands! ✓ ALL HARD SURFACES: Perfect For Use On Patios, Decking, Fencing, Paths, Driveways, Roofs, Sheds, Greenhouses, Garden Statues, Terracotta Pots, UPVC Windows, Boats, Caravans, Motor Homes And All Indoor & Outdoor Hard Surfaces Affected By Moss, Mould and Algae. ✓ PREVENTS REGROWTH: Once Treated Results Will Show In 2-3 Days. Spray & Leave Penetrates Your Outdoor Surfaces Creating An Invisible Barrier Which Will Help To Prevent Re-Growth For Up To Six Months! ✓ 100% SAFE & GUARANTEED RESULTS: Biodegradable PH8; Non-Caustic, No Acid & No Bleach! Jarder Spray & Leave Is Totally Safe For Children & Pets Once The Area Is Dried. Prepare To Be Amazed! Mix, apply and wave goodbye! Simply apply Jarder Spray & Leave using either a pump sprayer or watering can and walk away. Results show in 2-3 days and continue to protect your outdoor surfaces for six months – up to a year on certain fixtures! Make surfaces look like brand new after the moss, mould and algae had been destroyed! Perfect for use on Patios, Paths, Driveways, Decking, Fencing, Greenhouses, Terracotta Pots, Grave Stones, Artificial Grass, Boats, Caravans & All Outdoor Hard Surfaces. All forms of stone can be treated: Gravel, pebbles, block paving, Indian sandstone, Yorkshire stone, limestone, granite, flags to name a few. Jarder spray and leave is a concentrate with a recommended dilution rate of 1:5 with water. The solution can be applied neat or up to a dilution rate of up to 1:10 with water for less affected areas! Speed of results are dependent upon the dilution rate applied. Best to apply with a low pressure garden pump sprayer or watering can. Forget scrubbing or jet washing as large areas can easily be covered in very little time – Literally takes minimal effort to achieve the look you desire. This listing is for 4 x 5litre bottle of Jarder Spray and leave value pack!